Farming communities are easily recognized by the Ford blue and John Deere green of their heritage, however, there is one midwest town (Napoleon, Ohio) that has been colored Corvette red for over thirty years and most recently as of 1987 with ProTeam Classic Corvette Collection and Sales taking root. It began when the Michaelis brothers, Terry and Fred, wanted to reflect the same values they watched growing up in Henry county while selling the Corvettes from their youth. Since opening the doors at ProTeam, they have succeeded in building the most dynamic collection of Corvette color and high performance this side of the sun! These hometown boys have done good! Sounds like a great spin, doesn't it? I know you think it is just one more gold-clad used car salesman trying to get you through the door ready to "bait and switch" and leave you broke and broken-down. At least that is what I was expecting when I made the trip to Ohio's great Northwest. The buildings are unassuming, a fact made quite clear as I drove by the customer parking lot. It was the off-loading of ten more additions to ProTeam Classic Corvette Collection that gave the location away. I was greeted by ProTeam President Terry Michaelis as I admired his latest acquisitions. Terry spoke with an unique and refreshing passion for his business and the car while we discussed the art of the deal, the thrill of the chase, and the Corvette that had alluded him for so long. I imagined Hemmingway after a safari telling tales of the chase and that one moment when the big game he had traveled a continent to find was in his sights. I was impressed and hadn't even stepped inside. I had arguably the busiest man in the business of Corvettes agreeing to a half hour and we'd already spent ten minutes talking about one Corvette and the story it held and the car's immediate future at ProTeam. When we sat down in the plain painted-block that adorns his office, I was taken by the understated nature of the place. We sat surrounded by piles of photos, magazines, and artifacts from thirty plus years of "playing with Corvettes". It was among these ghosts that I began my journey with the man who owns the "Holy Grail of all Corvette Collections". TLM You have 30 minutes. I suggest you choose wisely. Terry smiles as he rolls an unlit cigar between his lips while checking the pile of messages that have accumulated since he greeted me outside. Interviewer Let's start at the beginning. How did you get here from there? TLM You have 49 more [questions]? I'll make it quick. My first Corvette was an average 1964 Corvette convertible purchased in 1971. I think I paid $900.00 for it. I cleaned and tuned it up and advertised it in the The Toledo Blade. It sold quick at $1,200.00. Sure beat working at the Campbell’s Soup Plant for $165.00 per week. Many other Corvettes were bought and sold during 1971, '72, and '73 and sometimes five to six per week but then in 1973, I bought a Corvette roller and immediately sold the hardtop for more than I paid for the entire car. The die was cast. I founded and ran a multimillion dollar parts business in the '70's and was proclaimed as the "King of the Corvette Aftermarket". Terry leans over and shows me the dusty book Sensuous American and I flip to the article. A much younger man leaps from the page but the same turn of the head and deep eyes connect the two faces separated by the decades. I took my lumps and learned some valuable lessons along the way. The advantage I had early on was my understanding of the unique relationship between a Corvette and its owner. The Corvette was more than a car to go fast in. It was a way to show individuality and the aftermarket was a perfect fit. However, we all grew-up a little smiling he adds, at least some of us did. The 80's ushered in speculators selling us on how valuable the toys from our youth were. "Return to original" was the new mantra and I changed with the times. My brother Fred and I left the parts business in order to again sell the whole Corvette. The 90's was a time when Corvette owners found pride in their work and wanted to show it off. The importance or maybe over-importance of the NCRS, Bloomington, and Vette Fest judges came into play. Corvette "trailer queens" were made into psuedo-stars among the Corvette elite. There was no such thing as "over-restored". It was a period that has subsequently setup the period we find ourselves in now. I am not just talking about the Corvette market but the classic car market at large. Along the way, my brother, myself, and in turn this company have became masterful in the craft of restoration and have become master garage-historians. Interviewer What do you mean by garage-historians? TLM We have shelves of articles, books, interviews, and most importantly decades of personal experience that give us a large window into what the Corvette nuance and the circumstance as they left the GM plants and showroom floors. Over the years we have prepared champions. Our Corvettes have won every award available on the Corvette circuit not once or twice but over and over again. We have knowledge and expertise that gives us yet another edge over the average Corvette seller. We know our stuff!!! Interviewer Let's talk about ProTeam Corvette Sales. Give us a feel about the day to day operations. TLM My brother and I oversee an immediate staff of roughly eighteen people with five of them being in sales. For the most part, they have all lived in the Henry County area their entire life. You would have to ask my employees about the working environment but our retention at ProTeam is enviable. Most of our staff have been here for over eight years and as long as eighteen years. Interviewer Is it the working environment, love of the Corvette, or type of employee that makes them stay? TLM We are a multimillion dollar international company but as I said, our employees are local. They have the same roots as I do. They've traveled the same roads I did as a kid. They have work ethics that mirror my own. Those that have been here for the long haul have pride in a good day's work, treating people decently, and they feel ownership in this company as we have a generous profit-sharing program structured on the number of years served. It is the "team" concept that makes this business model work. We consider our employees owners because ProTeam Corvettes is a reflection of their day to day actions. ProTeam is a small company so their work echoes in the phone calls, the way a customer is greeted, or the way an email is answered. We ask a lot and they always respond. Our employees want to make this company a success and that is a common goal shared across the entire company. Interviewer How about the typical Corvette buyer? Man or woman? What is it that they do for a living? TLM A baby boomer with expendable cash willing to part with it to buy something they desire and have a tangible investment they can hold in their hands. Boys will be boys and so by all estimates, men buy our cars on a near 4:1 or it could be 5:1 ratio but I would be a fool to think that women aren't a significant part of the buying process. As far as a particular profession, it is hard to say. The White-collar professional is no longer the predominate buyer. The Blue-collar construction worker saves and invests in these cars with the same gusto as the CEO who parks his Mercedes in our lot. Interviewer What makes ProTeam different from their competitors? TLM Real-time inventory of dynamic and desirable Corvettes. A one-of-a-kind money back guarantee. Experience and expertise. We flat-out know Corvettes. Interviewer Do you turn away any cars? TLM Of course we do. Very few pigs! We need Corvettes that represent the diversity of the Corvettes that are available and add value to our collection. Not just monetarily but in overall presentation. We do the legwork. Go on the wild goose chases and chase down the leads so clientele do not have to. These cars have provenance and when a customer walks through this door, there is no reason for them to leave disappointed. Interviewer Your inventory is unmatched without doubt but why do you have so many of each style and year with many the same color. TLM Ya' can't sell out of an empty wagon and it makes it easier when reloading our inventory. We know what people want and we give them that. Our Corvette collection is the most diverse in the world but our clientele has a lot in common with each other including many with the same taste and desires and it's important that we meet their demands. Interviewer How do you determine the history, provenance, and previous owners of a car? TLM The narrative of a specific Corvette through its documentation, VIN, trim tag, engine stamp, reputation, and a certain amount of blind trust in the seller. We generally are able to decode and authenticate most Corvettes. Interviewer Where are the sellers and where do you get the majority of your Corvettes? TLM We buy from the hundreds of private sellers who approach us with a Corvette for sale; many who purchased Corvettes from us over the last eighteen years and beyond, and from the specialty car auctions. Our cars come from as far away as Canada, California, and even Europe. Interviewer So you buy many cars back that you originally sold? What ratio? What is the most times you have owned the same car. TLM He takes the unlit cigar from the corner of the table and straightened a few papers and even stood over his computer to check the email. It appeared he'd forgotten I was in the room and for a moment, I was sure I had stumped him but then he leaned into his answer without missing a beat. My best guess would be one in five. It may be a bit high or low but it's a safe bet either way. I have probably repurchased the same car at most eight times but that is an anomaly. Our repurchases reflect the customer that wants to trade-up, find a different Corvette, or has reached the realization that Corvette restoration is not an easy proposition. Some customers have had their fun and their interests have turned from the classic car hobby. We benefit because we were impressed enough to buy and sell the Corvette once, it's an easier decision whether we buy the car again. We still must keep in mind the needs of our collection and the Corvette's current state in comparison to when it left Napoleon. Interviewer What is the most cars you have bought at one auction. TLM Less than 5,000 and more than thirty. It's hard to give firm numbers because so many of our auctions blend with cars for sale in the general vicinity of the event and also in the car corrals that pepper auction sites. Interviewer How do you attract international buyers to ProTeam? TLM The foreign market is more internet savvy than the average American plus the global economy makes access to American trade publications easy. They find us. It's an international truth, if there is someone who is interested in purchasing a Corvette, they will find ProTeam's collection and 200 Corvettes translates into hundreds of languages, as there are no language barriers when it comes to the Corvette attraction. Interviewer What do you think you spend a year in advertising expense? TLM Over $500,000.00. About $1,600.00 for each Corvette we sell. Postage and printing are two of our largest costs as we have a database/mailing list of over 380,000 people and we try to put our catalog in their hands at least once a year. Interviewer Do most of your buyers visit your showroom or buy over the phone? TLM There was a time in the not too distant past that we had 8,000 to 10,000 people come to ProTeam and view these cars every year but in 1996 we went on-line and it felt like overnight the way we did business changed. The bulk of our transactions are now done with the customer never stepping foot in Napoleon. We offer a rare and unique money back guarantee where people can safely shop at home and try the Corvette on for size and if for any reason, they can send the Corvette back to us. However, the one thing that has not changed over the years is that the customer doesn't just contact us once. They take their time and make contact several times before they buy. They build a relationship with ProTeam. This is not a total impulse buy such as an auction where you have three and a half minutes to make that faulty decision or the greatest purchase on earth. Most of our customers do their homework and in turn, they are informed and quite intelligent buyers. Interviewer How do you put a collection together like the "Magnificent Ten" (Ten big block convertibles all are '67's representing each factory color available) or the "Magnificent Seven" (Seven '57's: each a different factory color for every day of the week)? TLM A game plan... a theme and then adapting to what is available on the market. Being creative is a plus. Interviewer What is the busiest time of the year? TLM NOW!!! It is a twelve month push. Winter is when you sell Corvettes in July. Interviewer Which Corvette clubs do you associate with? Interviewer What other Corvette dealers do you work with? Interviewer How do you ensure customer satisfaction? TLM We stand by our word. We offer a money back guarantee. We lay it all out on the line. Most importantly, we communicate after the sale. We strive to not let the customer sway alone in the wind. If there is a question about the peculiarities of the old Chevy's we sell, we answer it. If there is a problem, we work it. Most times it is resolved to the satisfaction of everyone involved but sometimes we miss. We do the best we can and are proud of the successes and learn from our failures. Interviewer Do you restore Corvettes? TLM Yep. We are among the best but we just don't have the time. We house the most dynamic collection of Corvettes in the world and that takes up a lot of our time, so we attempt to buy Corvettes that are already restored. Interviewer If one of your customers needs a modification to the car in order to buy a Corvette, what do you do to accommodate them? TLM We make the modification. The customer is always right. Interviewer What is the definition of a collector car? TLM A car that is X years old that is beautiful just sitting still. Does not need a motor. Still makes a great planter! It is like art. It's subjective. It's all in the eye of the beholder. One man's centerfold is another man's dog. He smiles in a way that suggests old car guys never change. Interviewer What is a muscle car? TLM A car that goes fast even when it’s standing still and generally has a big gas guzzling engine. Interviewer What is a big block engine? TLM An engine that thumps the ground you walk on, similar to a Harley Davidson. Interviewer What is the difference between a C1 and a C2 Corvette? TLM The preference of the onlooker. Terry is growing weary of the questioning. The answers are shorter and the interruptions are longer. I look at the clock and we've gone well beyond the thirty minutes. I could hang it up and go home but decide to push him a bit more. Interviewer What is the difference between buying a car at a public auction versus a private dealer? TLM Decision making time. Three minutes versus three months. Interviewer Then what are the benefits of buying Corvettes at auction? TLM Bargains, fully priced Corvettes (for that day), exposure, and car corrals full of "No sale" overpriced Corvettes. Interviewer Does the price people are willing to pay at a public auction have merit in what is considered a collector and hence, a good investment. TLM Don't get me wrong. Curb appeal is important but the price at auction goes a long way to labeling what is most desirable and helps establish the price under that tent and the circumstance of that day at that time. Interviewer What are the best Corvette investments? TLM Whatever is moving the market at the moment and the price you paid or should I say, underpaid. There is a certain fluctuation at all times and that is what makes the collector car market fluid, healthy, and is a sign of growth and new blood. However, you can't go wrong with most classic Corvettes and there is an amount of pleasure-return on all Corvettes. Buy what you like, buy with your heart, buy with your head, and just enjoy! You will catch the fever!! Interviewer What advice do you have to a beginner entering the hobby? TLM Love the marque! You can't buy a collector car if you don't have an affinity for them. You must admire their attributes and laugh away their faults. Interviewer Should a newer buyer with $40K to spend start with a lower end classic or a newer late model Vette? TLM Buy what you love and love what you buy! If you love comfort, buy new. If you love the feel of the road, the taste of excitement, a work of art, and want to just look cool, buy a classic Corvette, 'cause once you catch the fever, you'll be back for more. Interviewer What do you look for when buying a Corvette? TLM It depends on the variable... variables such as inventory needs, clientele demand, bang for the buck, and price. The rest are our trade secrets that are only developed with a lifetime commitment to the marque. Interviewer How do you determine an investment grade purchase versus price-point purchase? TLM Usually within three minutes and drawing from a template formed from the experience of 10,000 transactions. Interviewer What do you like most about the industry? Interviewer What do you dislike about the industry? TLM The People. Terry reacts to my straight-line but quickly catches himself. We do have a segment of the Corvette population who have become too smart by half. They educate themselves out of the cars they love because of the perceived investment value and negative erroneous advice. They believe these cars are their ticket to easy street and disregard the car they desire as inferior. However, the ones that get me are the customers who treat this hobby like a business but expect that I should run my business like a hobby. Those people burn me. Interviewer Is there anything else about the industry you would like to see changed? TLM The emphasis on "correct" Corvettes with better than good market return. I want people to love these Corvettes for what they can give back while they drive it down the road or sit among the gang at a club show. The monetary return has got to be secondary when the decision is made to own the beauties. Interviewer The politics of judging a Corvette has made news recently. What are your views on the culture of the giving of Corvette awards and honors in the major events? Do you think the over emphasis is having a negative effect on the Corvette hobby? Interviewer Do you think the collector car hobby has a large following? TLM Yes. Follow me to Scottsdale (200,000 people) in January, The Woodward Dream Cruise (1,500,000 people) in August, the Kruse Auction Park in September (150,000 people), or even go to a local cruise-in on Friday night. The passion is there and it's infectious. Interviewer What is the most desirable Corvette on the market? Interviewer Why such an emphasis on the 1967? TLM It is the Corvette at the height of design, horsepower, and engineering. Any Corvette before it was building toward the zenith in 1967 and anything after this model year has paled in it's shadow with few exceptions. The 1967 Corvette has not been replicated and no excess of steel and over-engineering seen in the current car culture can capture the spirit and soul of this one year of the Corvette. It's hot dogs, baseball, and apple pie... and I love pie! Interviewer What is the most money ever paid for a Corvette? TLM Privately, over four million for a 1963 Grand Sport. We did set a record in January 2005 for the sale of a 1958 Corvette at auction with our one of a kind 1958 Corvette Retractable Hardtop but a 1954 Corvette disguised as an Oldsmobile sold for over three million at the same auction in January. Interviewer Do you think it was worth it? TLM You will have to ask the person who bought it. Interviewer I'm new to this hobby and want to have a few guidelines when finding my first classic Corvette. Let me pick your brain and draw on your vast experience, can you let me in on a few Corvette buying "trade secrets"? TLM Oh, flattery will get you everywhere but I wouldn't consider them trade secrets. In fact, we want to arm our future classic Corvette customers with information. We need to be talking the same language and have the same goals in mind when assisting in a Corvette purchase. We publish six tips in each issue of our catalog and on the ProTeam website. In short the tips are: (1) Buy the best Corvette you can afford, because the Corvette you buy is the Corvette you may sell someday. (2) Buy cosmetics. Meaning that you buy paint and chrome. This will help control your future costs. (3) Research and arm yourself with information. Knowledge is power and it is readily available but beware, there is as much erroneous information as good. (4) Don't trade off cosmetics for a numbers match drivetrain. It will cost more to restore a Corvette needing restoration than it will putting the proper numbers restoration motor back in your vehicle if that is your desire. In recent years, numbers have become secondary to cosmetics and utilization. We welcome the change. (5) Corvettes are old cars. They require more TLC than that new SUV setting in your driveway. The best running and most reliable automobiles are those used on a regular basis. These old horses need ridden. In that same vain, we feel The most important tip we can offer is to (6) Go out and have fun. Drive your Corvette. Join a club. Go to Cruise-ins. Enter your 'Vette into local shows and leave your ego at home and then learn to wave at other Corvette owners… Share the joy! Interviewer Can you give me "Terry's Top Ten" Corvette picks. TLM Front of the pack is the 1967 Corvette any body-style. 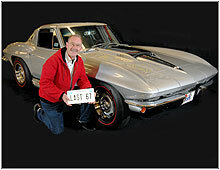 People who advertise a 1967 Corvette for Sale have their phones ring off the hook… We Do!! Next in no particular order are the 1958 through 1962 Corvettes. Boomers love the four headlights and the trunk! The 1968 to 1972 Corvette. They are affordable and considered an entry level model but not for long. They are quickly finding their voice in the classic Corvette community. As always, the 1963 Split Window Coupe. A one year ever popular milestone car. Every collector needs at least one. The 1965 and 1966 Corvettes are good cars. They are the next best thing to a 1967 but more affordable. 1953 and 1955 are for a serious collector who just has to have one. Comfort is secondary in this generation but sometimes, comfort isn't everything. The years 1956 and 1957 offer single headlights and strong styling. Bringing up the rear are the 1973 to 1975 convertible. Very affordable rubber bumper cars for people who likes to drive with the top down. The 1978 Silver Anniversary and Pace Cars are a blue-collar favorite. Try to buy four speeds, L-82’s, and/or low miles. Last but not least, the 1982 Collector Edition unique in its paint and has many lasts and firsts but buy low miles and remember one Corvette is the beginning of a collection... and two is never the end! Interviewer Do you think there is a bubble in the muscle car market? TLM Short answer is no but let me give you the reason why I am so sure. First, Corvettes routinely out gain stock portfolios. This has been true for well over a decade with no sign that either Wall Street or the mythical Greenspan will change that equation. I understand that what comes up does come down but the money base is larger than it was in the pricing run-up to 1989. New blood and money enters the collector car market every day. Let me ask you, are the gas prices on a bubble? Of course not, there is a certain threshold and the expectation of price is there and it won't be taken away. Same for the prices on these cars. The price to own these cars are well-known and negotiable but rarely is it negotiated below the recorded market price. A broad base of money resides in the pocket of the Baby Boomers. They hold the world famous collection of dispensable, discretionary income, and assets ever in the country's past or possibly the future and they want something special. Boomers control much of the monetary whims of the economy and they prefer a hard tangible asset they can enjoy and prefer instant gratification while filling voracious egos owning something that no one else has. Interviewer What is your response to people who say ProTeam is guilty of pricing up the Corvette market. TLM Leaders in any industry are frequently accused of gouging and cheating their way to the top. We accept that and happily address the people who make these claims. What some in the Corvette community do not understand is that we are at the whim of the price of these cars too. We don't manufacture classic Corvettes and then put them up for sale. It serves no purpose for us to artificially raise prices because we will pay the same prices we inflate to reload our collection. There is only a certain number of classic Corvettes. They are not making anymore of them. We actually tried to curtail the rocketing prices this past January by creating a "breath" between Scottsdale and the sale of the Corvettes we purchased. We were accused of trying to run up prices by not posting them. We were protecting the market and future ProTeam purchases. We are a catalyst for the market by our shear number of Corvettes and our presence on-line and in almost every Corvette publication nationwide. We accept that responsibility and understand that a stable, true, and fair market value on the Corvettes is in the best interest of everyone. Our sales and prices are market driven by results of past sales and public sales. With that answer, we were through. It wasn't quite fifty questions but it was enough. Terry Michaelis leapt from his desk to put-out one of the many fires that flare-up daily. He shouted marching orders to his staff and they responded to his verbal shorthand without skipping a beat. I heard him leave and several quiet minutes passed before I gathered my notes and excused myself from the empty office. I wandered unnoticed through the front office running the gauntlet of file cabinets and employees that make this business run. I took the standard tour of the facility and was nearly as impressed with the inventory as I was with the man who makes this collection come alive. I have no doubt that someone somewhere will build a collection that rivals this one but I would bet my press pass that no one will ever match the man from Napoleon who gave me his most valuable commodity, his time.